1. Combine the pineapple, peppers, onion, cilantro, parsley, chili and 1/2 of the oil and lime juice together in a medium glass bowl. Season with salt and pepper to taste. Cover and chill for 50 minutes. 2. Prepare the BBQ (High heat). 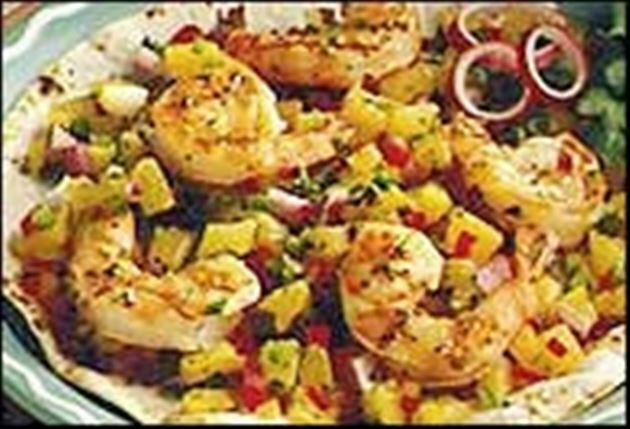 Combine the remaining oil and lime juice together and add shrimp; toss to coat with marinade. Grill until opaque, about 1 minute per side. Grill tortillas on each side for 30 seconds. Place 5 shrimp onto each tortilla. Spoon on salsa and serve. Enjoy this delicious Shrimp tortilla grill Mexican recipe!